Bike Racks / Cycle Carriers. Lights / Lamps / Lenses. 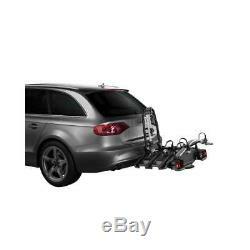 Thule VeloCompact 4 Bike Cycle Carrier (927 + 4th Bike Adaptor 926-1). Thule VeloCompact is the next generation of compact and lightweight bike carriers, perfect for every day use (for 3-4 bikes). The Thule VeloCompact 927 has the next generation tow ball coupling, enabling transport of up to 4 bikes and making the mounting of the carrier to the vehicle significantly easier. Easy mounting and adjustment of the carrier before closing the tightening handle thanks to the tow bar coupling's initial stability. Possible to increase load capacity to 4 bikes by adding 4th bike adapter. Easy mounting of bikes through detachable bike arms. Carries bikes with large wheelbases thanks to single action extend-able wheel holders. Simple to fasten wheel thanks to long wheel straps with pump buckles. Simple to fold flat and store - fits most car boots. Easy boot access even with bikes mounted thanks to smart foot pedal tilt. Lock your bikes to the bike carrier and your carrier to the tow bar (locks included). Pre-assembled, no tools are required. For full specification see attached spec document top right of the page. Thule VeloCompact 927 + 4th Bike Adaptor. Thule's most compact and lightweight bike carrier yet. 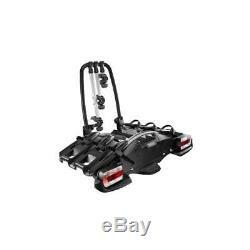 This kit consists of the 927 - 3 Bike Cycle Carrier and the 926-1 adaptor which allows you to increase the capacity by 1 x bike. Max Number of Bikes - 4. Fits to any 50mm tow ball. Fits Frame Dimensions - 22-80mm. Electric Connector Type - 7 pin. Note: This carrier may not tilt far enough to allow the tailgate to open on some vans. Thule VeloCompact is the next generation of compact and lightweight bike carriers, perfect for every day use. Trident Towing have many solutions to this common problem. We are a family run business established since 1976 with trained staff offering correct product information & advice on all aspects of our entire product range. We always strive to put quality before quantity and as a result have many long term customers and achieve much of our sales through repeat business and word of mouth recommendation. If you have ordered multiple items they may arrive separately. We will do our best to get all orders sent out as quickly as possible. Occasionally we find ourselves having to withdraw an item because it has become obsolete or has been discontinued. If you have placed an order for an item that has been made obsolete we will inform you as soon as possible and offer you an alternative if one is available. The item "Thule VeloCompact 4 Bike Cycle Carrier (927 + 4th Bike Adaptor 926-1)" is in sale since Wednesday, January 17, 2018. This item is in the category "Sporting Goods\Cycling\Car Racks". The seller is "trident-towing-shop" and is located in ME15 9YY.